I was on a recent episode of The Tome Show’s D&D V&G podcasts! The D&D V&G Crew are joined by Round Table Host and overall Great Guy James Introcaso to discuss Stronghold, a 1993 city builder/RTS sim hybrid game. Before the discussion can get really get underway, however, the boys find themselves magically transported back to 1993 by a Time Wizard! Will 1993 Rudy, Alex, Vegas, Greg, and James (who somehow all retain their ages and adult maturities yet no knowledge of future games) show Stronghold some love for being so unique among its contemporaries? Or will they chastise and awkwardly compare it to games that they haven’t played since they were 4-8 years old? Will this Time Wizard character be returning in future episodes or is it going to be just a stupid, clearly last-minute one-off appearance? Tune in to find out! Also rate and review us on iTunes, it helps a boat load! Let’s talk dungeons! It’s the theme of this month’s RPG Blog Carnival. Many thanks to James Eck over at Mind Weaver RPG for hosting and coming up with this awesome idea. Everyone loves a good dungeon! I’ve given my opinion in the past on building adventure sites. Canus is chock full of them! Aberrant ruins, unexplored jungle temples, Underdark labyrinths, and more! AD&D Forgotten Realms FTW BBQ! Since I’m designing a campaign setting, I want to share with you some interesting dungeon locations I’ve written for the Exploration Age Campaign Guide. I’m taking a page out of Ed Greenwood’s playbook. In a recent Tome Show podcast of a Gen Con Forgotten Realms panel, Greenwood and R.A. Salvatore discussed the beauty of the original grey box, which was the first product to bring the world a fully realized Realms. Greenwood went on to say he did not flesh out every single dungeon and adventure site in the Realms with a map. That would have been too expensive to print, more work than one person could do in a timely manner, and too prescriptive to DMs (and authors like Salvatore) who wanted a toy box, but not directions on how to set up the toys. For those reasons I’m doing the same thing in Exploration Age. Also, it’s good for me to give out information in small chunks so that I create a campaign guide both DMs and players can read. This is good for two reasons. First, many DMs are also players in other games, so I don’t want them to read through the book for their game and then feel like they can’t run a PC in another because of what they know. 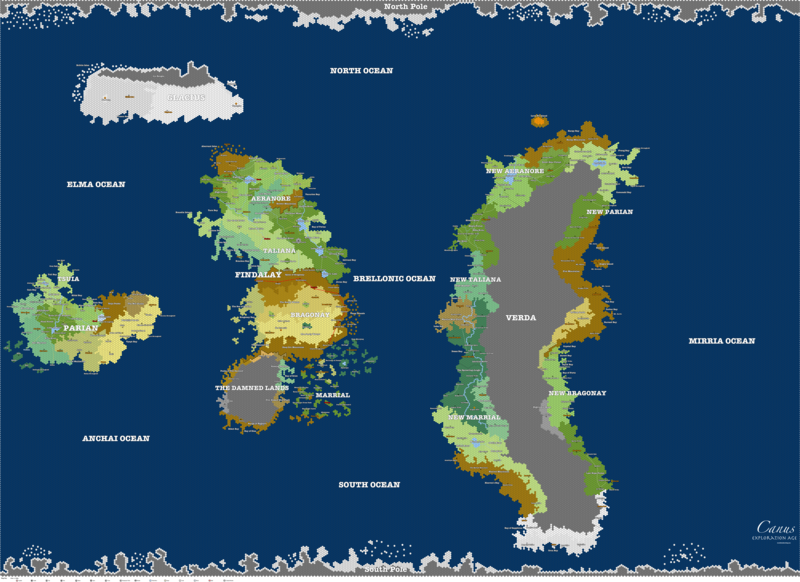 Second, I want players to be able to read the Exploration Age Campaign Guide freely so they can also get to know the world. If all the dungeon details were in the book, PCs would be going into a monster lair knowing every secret door, combat encounter, and trap. As a bonus, it’s good business to put out a book both players and DMs can buy. That thinking from the original grey box has carried over into modern products. If you look at the fourth edition campaign guides for Forgotten Realms, Eberron, and Dark Sun, you’ll see that thinking of giving out a small paragraph or two of info for each adventure site is far more common place than fleshing out the entire thing with maps and creatures. 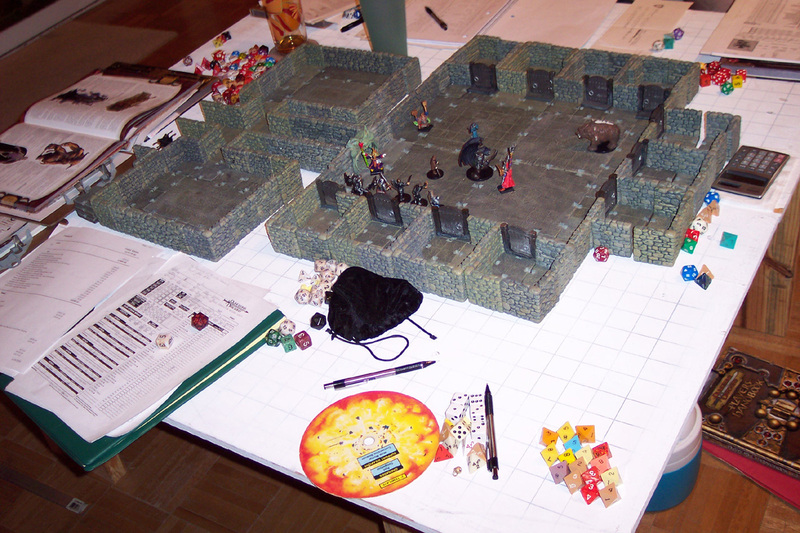 Let’s face it, when someone says the word dungeon to a D&D player, most of us think of an underground tunnel complex, ancient ruin, or dark castle. Though really a dungeon can be any place with encounters, decision points, and rewards. More simply a dungeon is any place an adventure takes place. It doesn’t have to be old, dark, smelly, and out of the sun’s light. In fact, you can lay out a wilderness adventure or a murder mystery during a jackrabbit ride the same way you might a dungeon. Plan out some encounters ahead of time, detail some key areas, and you’re off to the races. You can even throw some good decision points in there, like do the players summit Mt. Inferno, do they pass it to the East where the Skullbreaker orcs live, or pass it to the West where Salvanaxiavarion the red dragon makes her home. Really any adventure site is a dungeon. And so, without further adieu, some adventure sites from the Exploration Age Campaign Guide. Mageforge Bragonay’s first attempt at magical terraforming went horribly wrong. At first the research facility of Mageforge’s gardens were lush and successful, but the crops continued to grow. Rapidly a living jungle overtook the research facility and the land around it. The plants came into a mind of their own and tore apart the facility, scattering its contents everywhere and killing the inhabitants. The place is now a living jungle, still full of interesting research and items the dwarves were creating, but every living thing in Mageforge is teeming with hate for humanoids, especially those who seek to rob their treasures. Deep Orc Mountains No landform has a more appropriate name in all of Findalay than the Deep Orc Mountains. The orcs used to live throughout The Spine of Bragonay and The Wastes, but the united orc tribes raided one too many dwarf caravans and former Empress Falahdrah ordered The Black Blood Purge. The dwarves drove the orcs into their own section of the mountains while also seeding agents within the orc ranks to sow discord. In thousands of miles of twisting tunnels the orcs now war against themselves. This was a genius move on the part of the dwarves, for monstrosities coming out of The Damned Lands are now the problem of the orcs and not theirs. Within the Deep Orc Mountains there is a miracle device. The altar of true resurrection is one of the most sought after artifacts in all of Canus. This hidden altar casts true resurrection without material components on any deceased body (or piece of a body) placed upon it. Once the altar is used it melts into the stone and reforms somewhere else within Deep Orc Mountains, making it nearly impossible to find. More folks have lost their lives seeking the altar than have actually used it. Deadwood Castle The forest around Deadwood Castle is full of gray rotting trees covered in mist. The animals do not go anywhere near the place and as such it is eerily quiet. The castle has been there since before the elves arrived in Taliana. Those who are brave enough to enter the wood and face the undead animals that sit silently in wait for prey have found Deadwood Castle is under the care of an undead aberrant of colossal proportions. No one is sure what the lord of Deadwood Castle may want, but he always allows any party who foolishly wanders into his land to escape peacefully, provided they leave one member behind for his “studies.” He makes the trespassers decide which friend to leave behind and seems to take glee in watching the painful choice be made. The rest live, returning home and tell the tale. Ruins of Grayonus Grayonus was once a keep run by a lovestruck halfling army captain named Bellink Barrinon. Bellink had fallen for a beautiful halfling maiden he saw out his window every night. He would call to her and she would disappear into the forest. Legend says one night he followed her into the forest where she waited for him. Bellink took this mysterious woman who did not speak as his wife and moved her into Grayonus with him. The woman gave birth at midnight during a red moon and she birthed 100 fully mature slaadi. The slaadi murdered everyone in the keep except for their mother and have lived there ever since protecting the voiceless, nameless woman and causing havoc for any passersby. Last Hope Forest The tribes call this forest Last Hope because it is right on the edge of the Nightmare Wood. All of the undead creatures and oozes which call the Nightmare Wood home do not cross the living tree line. However, Last Hope Forest is not without its dangers. The wood is home to a colony of doppelgangers who have developed a taste for the flesh of humanoids. They find preparing the meat of humanoids is an art, and take a sick pleasure in assuming the appearance of the person they are eating. Unfortunately for the Bragonians, they recently developed a taste for dwarf. Murder Lake Murder lake is fed by Pain River and Death River and then its water flows out to the sea via the Thirst River. All these bodies of water are aptly named, for any who drink from the waters must make a DC 15 Constitution saving throw or lose 1d4 points from their Constitution score. These points may be regained at a rate of 1 per day provided the afflicted doesn’t drink from the waters again and take more Constitution damage. A lesser restoration or similar spell can also restore these points. The Roc Tribe seems immune to these effects and lives by the affected bodies of water. They claim the source of this weakening is an undead kraken at the bottom of the 500-foot depth of Murder Lake. The kraken has cursed the water, but the Roc Tribe offers the beast a humanoid sacrifice every year in exchange for not feeling the effects of the curse.